BMW has outlined its plans to launch M versions of the X5 and X6 in 2015. The high performance pair will be powered by a 575PS 4.4-litre twin turbo V8 and be capable of covering 0-62mph in 4.2 seconds. 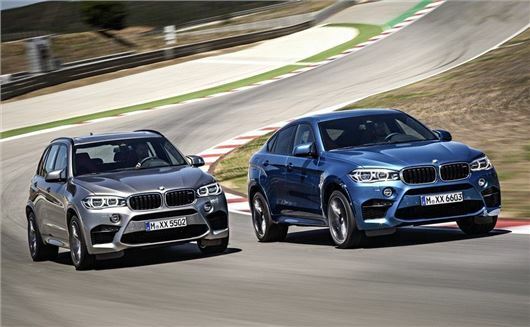 The BMW X5 M and X6 M will reach UK dealerships on 11 April, 2015, and be priced at £90,170 and £93,070 respectively. Capable of reaching an electronically limited top speed of 155mph, the BMW X5 M and X6 M promise to be brutally quick, with 750Nm of torque available from just 2200rpm. To cope with the colossal grunt, BMW has given both models an eight-speed M Steptronic ‘box, with a wider gap between the gear ratios to improve performance. BMW has developed the M cars at the Nurburgring and claims that both can generate up to 1.2g in the corners, without problems. Both the X5 M and X6 M get launch control as standard along with an uprated four-wheel drive system, which includes a new DSC (Dynamic Stability Control) system. The track optimised powertrain has three driving modes, with varying degrees of electronic aids. Both the X5 M and X6 M will sit 10mmm lower than the standard models and feature electronically controlled flaps within the exhaust system help to provide a riche sporty soundtrack. Fuel economy is a claimed 24.4mpg for both vehicles, while CO2 emissions is a hefty 258g/km, which puts theses four-wheel drive monsters into the highest VED bracket, which is fittingly Band M. As you'd expect from a 575PS SUV, the suspension is firmer and the damping can be customised with three driving modes - Comfort, Sport and Sport+ - which will stiffen the ride and improve the responsiveness of the electronically assisted rack and pinion M Servotronic steering system. Styling upgrades are included as part of the M treatment, with larger air intakes at the front and a new diffuser at the rear. Both cars feature twin-stalk exterior door mirrors, with integral indicators, and a four-tailpipe exhaust. The X6 M also gets a rear spoiler to reduce rear-axle lift. The M styling is carried into the interiors too, with M branding, gearshift paddles and leather sports seats. Standard equipment is decent for a £90,000 SUV, with cruise control with brake function, hill Descent Control, front and rear park Distance Control and a rain sensor with automatic headlight control. BMW Professional DAB radio is also fitted, with a 20GB hard disc drive, along with an M-specific Head- up Display, BMW navigation and an on-board computer. Both the X5 and X6 get Pirelli P Zero tyres (285/40 R20 Y at the front and 325/35 R20 Y at the rear) on 20-inch alloy wheels are fitted as standard, but 21-inch wheels with Michelin Pilot Super Sport UHP tyres (285/35 R21 Y front; 325/30 R21 Y rear) are optionally available.